Everyone knew that when Star Wars: The Force Awakens finally arrived in theaters it was going to be a monster. This past weekend that arrival happened, and a monster it surely is. 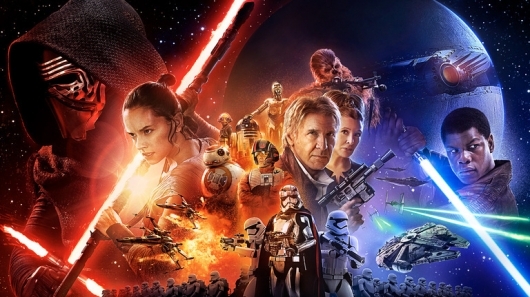 The box office numbers are in, and The Force Awakens went ahead and claimed some records to kick things off. Back in June, Jurassic World surprised all by taking off like a rocket on its way to breaking The Avengers‘ $207.4 million domestic opening record with a $208.8 million debut, leading Marvel to send along congratulations. Now, Marvel and Universal can both prepare a congratulatory card, maybe a nice fruit basket, for the new Star Wars, which threw down an unbelievable $248 million domestic opening. This should be easy for Marvel, as they reside in the same house owned by a certain mouse with the new record holder. In addition to securing the biggest domestic opening weekend, The Force Awakens also secured the records for largest single-day total at $120.5 million, which came after becoming the first film to hit nine figures in a single day; biggest preview day at $57 million; biggest IMAX opening at $48 million, and plenty more. One record the movie didn’t break was biggest opening weekend overseas. There it made $279 million, coming in third place behind Harry Potter and the Deathly Hallows Part 2 ($314 million) and Jurassic World ($316 million). Because of this, the grand total opening worldwide still belongs to Jurassic World at $524.9 million, with The Force Awakens in second at $517 million. This is, in part, due to the latter not having been released in China yet. (It also won’t open in Greece and India until December 24.) Jurassic World scored $99 million in China its opening weekend, while the new Star Wars won’t be released there until January 9th. None of this is too surprising—as mentioned above, everyone expected the movie to be a monster. The real question going in was if it would be the monster that could dethrone the current box office king, James Cameron’s Avatar. It’s a damn good start, but it still has a ways to go to hit that movie’s insane $760.5 million domestic total and $2.7 BILLION worldwide total. Jurassic World ended up finishing in third in both behind Avatar and the previous king, Cameron’s Titanic, with $652.2 million domestic and $1.6 billion worldwide respectively. · Biggest Thursday preview gross with $57M. · Biggest Friday and biggest single-day gross with $120.5M. · First film ever to post a single day over $100M. · Fastest film to $100M and $200M. · Biggest December debut (nearly 3 times previous record of $84.6M). · Biggest IMAX Thursday night preview ($5.7M), single-day ($14M, Friday), and weekend ($30.1M). · Highest theater average for a wide release ($57,568). · Biggest IMAX global debut of $48M. · Biggest opening weekend of all time in UK (4-day), Australia, Russia, Germany, Sweden, Norway, Finland, Austria, Poland (3-day), Denmark (5-day), Romania, Hungary, Bulgaria, Croatia, Ukraine, Iceland, Serbia, New Zealand. · Second biggest opening weekend in France, Belgium, Israel, Chile. UPDATE: According to Box Office Mojo‘s numbers, The Force Awakens actually passed Jurassic World’s overall worldwide opening record as well, taking in $529 million globally instead of the previously reported $517 million.